汪小英, 余艳荣, 王美玲, 彭维杰, 罗丹. 吴茱萸次碱抑制AngⅡ诱导的血管平滑肌Cx43表达上调[J]. 中国药理学通报, 2018, 34(8): 1139-1144. WANG Xiao-ying, YU Yan-rong, WANG Mei-ling, PENG Wei-jie, LUO Dan. 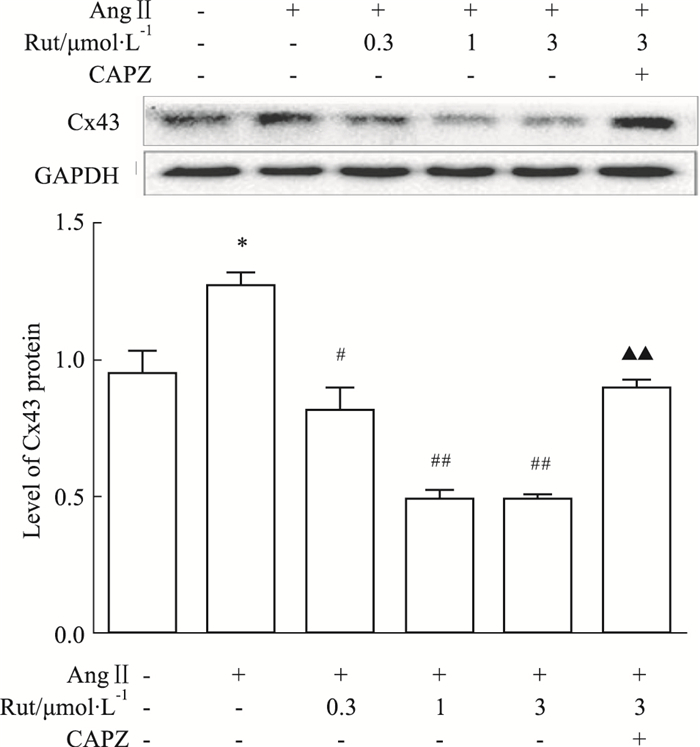 Rutaecarpine prevents up-regulation of Cx43 in vascular smooth muscle cells induced by angiotensin Ⅱ[J]. Chinese Pharmacological Bulletin, 2018, 34(8): 1139-1144. Abstract: Aim To investigate the effect of rutae-carpine (Rut) on expression of connexin43(Cx43) and the proliferation and phenotypic switch of vascular smooth muscle cells(VSMCs) induced by angiotensin Ⅱ(AngⅡ), and its possible mechanism. Methods VSMCs were pretreated with Rut (0.3, 1.0, 3.0 μmol·L-1)for 10 min, then co-incubated with AngⅡ (1 μmol·L-1) for 24 h. The transient receptor potential vanilloid 1(TRPV1) competitive antagonist capsazepine (CAPZ, 10 μmol·L-1) was used to investigate whether TRPV1 mediated the effects of Rut. Western blot was used to detect the protein levels of Cx43 and NF-κB p65 in VSMCs, and immunocytochemistry was applied to determine the nuclear translocation of p65. CCK-8 and EdU were used to detect the proliferation of VSMCs, and flow cytometry was employed to detect cell cycle distribution. Again, Western blot was used to assess the α-SMA and Calponin levels of contractile marker protein. 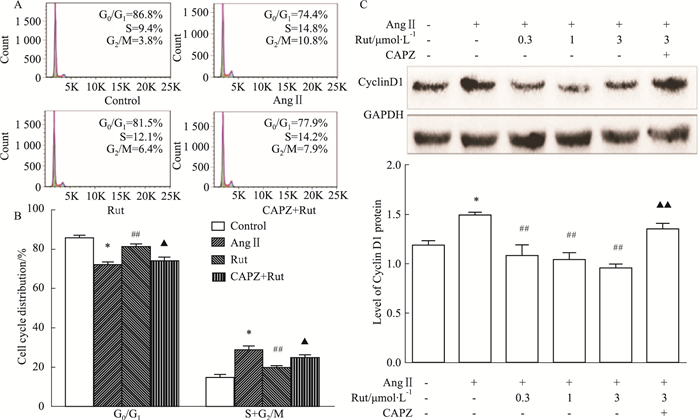 Results Rut prevented the up-regulation of Cx43 and nuclear translocation of p65 induced by AngⅡ, and the effect was blocked by CAPZ. Rut prevented the proliferation of VSMCs induced by AngⅡ, as presented by inhibiting DNA synthesis and cell viability in VSMCs. Rut also prevented phenotypic switch of VSMCs induced by AngⅡ, and the effect could be partially blocked by CAPZ. Conclusion Rut reduces the expression of Cx43 and prevents the proliferation and phenotypic switch of VSMCs induced by AngⅡ, and its mechanism involves the TRPV1/NF-κB signaling pathway. 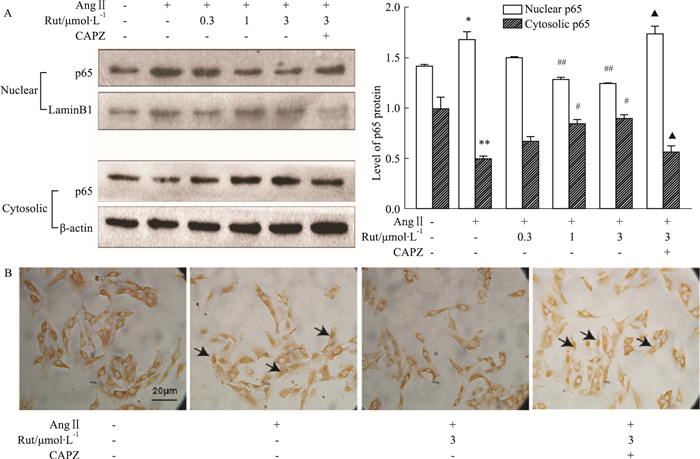 Fig 3 Possible mechanism of Rut in down-regulation of Cx43(x±s, n=3) A:Rut inhibited p65 transposition induced by AngⅡ using Western blot; B:Rut inhibited cytoplasm p65 transfer to nucleus induced by AngⅡ using immunocytochemistry. *P < 0.05, **P < 0.01 vs control group; #P < 0.05, ##P < 0.01 vs Ang Ⅱ group; ▲P < 0.05 vs AngⅡ+Rut (3 μmol·L-1) group. 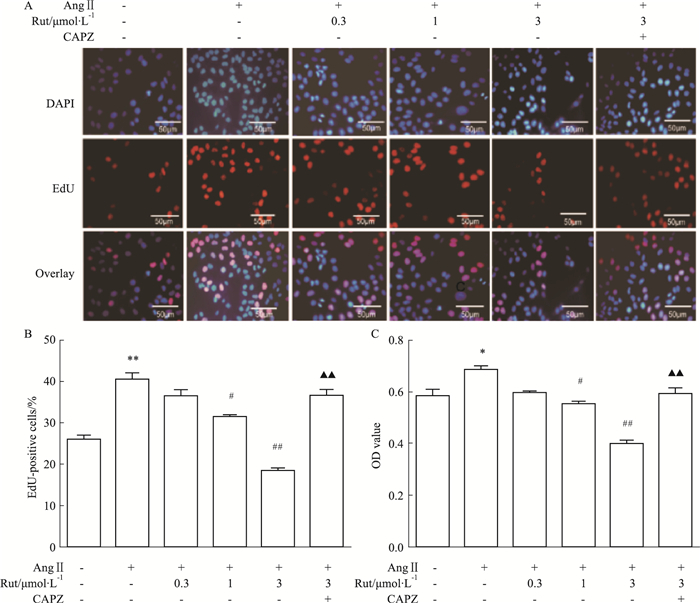 Fig 4 Effects of Rut on proliferation of VSMCs induced by AngⅡ(x±s, n=6) A:The cell proliferation result by EdU staining; B:Analysis of the percentage of EdU-positive cells; C:Cell viability result detected by CCK-8. *P < 0.05, **P < 0.01 vs control group; #P < 0.05, ##P < 0.01 vs AngⅡ group; ▲▲P < 0.01 vs AngⅡ+Rut (3 μmol·L-1) group. Fig 5 Effect of Rut on VSMCs cell cycle induced by AngⅡ(x±s, n=3) A:Cell cycle distribution detected by flow cytometry; B:Analysis of each phase percentages of cell cycle; C:The expression of cell cycle related protein Cyclin D1 by Western blot. *P < 0.05 vs control group; ##P < 0.01 vs AngⅡ group; ▲P < 0.05, ▲▲P < 0.01 vs AngⅡ+Rut (3 μmol·L-1) group. 李艳菊, 张锋, 龚其海, 等. 吴茱萸次碱抑制血管紧张素Ⅱ诱导的大鼠血管平滑肌细胞增殖[J]. 中国结合医学杂志, 2014, 20(9): 682-7. Li Y J, Zhang F, Gong Q H, et al. Rutaecarpine inhibits angiotensin Ⅱ-induced proliferation in rat vascular smooth muscle cells[J]. Chin J Integr Med, 2014, 20(9): 682-7. Chinese Pharmacological Bulletin, 2018, 34(8): 1139-1144.